Hello there! Apologies. My monthly scavenger post is later than ever. I finally scavenged the last two shots today - the others are from my holiday in France... no, surprise there. I must confess I forgot to take the list with me and so it was a bit like playing a good old-fashioned-pre-internet memory game. I could only remember about half of the titles but because of the sheer (yawn) quantity of photos taken, I found on my return, I had almost all the list covered from my holiday snaps alone. Moral of the story - if in doubt take a photo of everything or perhaps remember to write the list down! I always have fun with this challenge and hope you enjoy my interpretation of the list! Thank you Greenthumb and go check out some of the other collections posted. There are some very creative folk out there. Black. Charred peppers from a bbq. Eleven. This property was just a few doors away from where we were staying and I loved its character. Something very old. This 14th century market hall roof in the town of Nolay. The magnificent framework is made from chestnut and weighs 800kg per square metre. Something very bright. 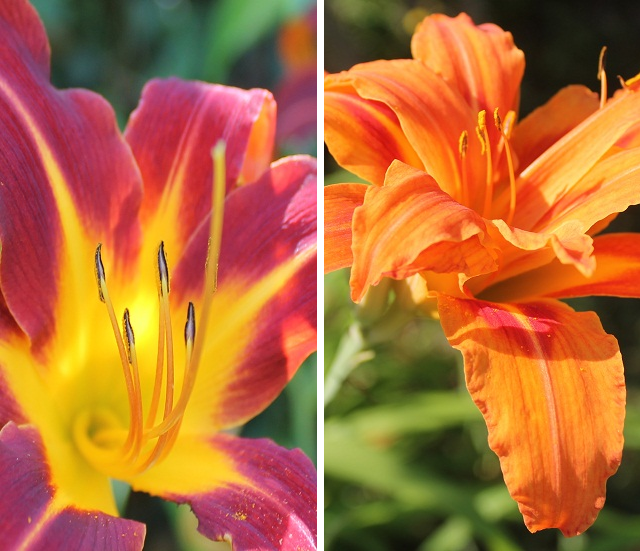 Two bright lilies from the village. Coins. A single coin given to me by my Dad. Roman, I think. Wheels. This was fun... my youngest cycling through a tunnel on a disused railway track. The great outdoor. Mist over the hills on a wet day. Smile. This scarecrow was made with love. Lovely photos. I particularly liked the one of your son. It made me think of how many pictures I have of my children taken from behind. Great set of photos, I love black, wheels and feet. I love your photos and am very envious of your holiday in France!! I look forward to seeing what you come up with for August.